Professional, active, notoriety, dynamic, radiant, organised and a leader. I left college in 1979 with a certificate in professional competence, as a Mechanical Fitter. 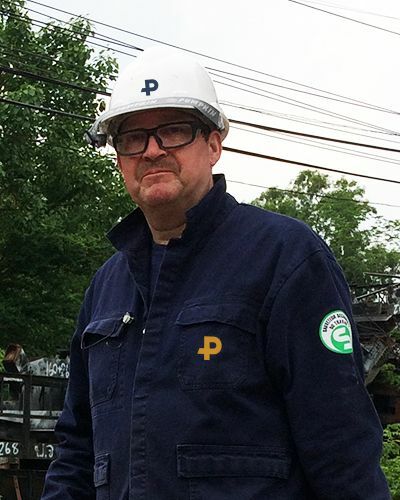 I underwent vocational training to improve my skills and joined the Pandrol maintenance department in May 1979. In 1989, I became part of special task team to establish the Manufacturing and Maintenance of Track Equipment Department. The introduction of electrification gave me the opportunity to express my skills in manufacturing, assembling, wiring and repair, while undertaking technical assistance missions at customer’s premises. I’m based at the Pandrol factory in Raismes, Region Hauts de France; located 2 hours 20 minutes from Paris and 1 hour 40 minute from Brussels. My role spans all the stages between manufacture, assembly, technical assistance and eventual after sales service. My work involves diagnosing defects, generating quotes based on resource requirements and quality control. My biggest challenge was a highly technical customer brief to automate the collection of electric current – instrumental to a system designed for electrical contact between a trolley bus and tramway. This project was delivered simultaneously to preparing for my professional diploma exams. Obtaining my professional diploma with distinction at the age of 43 has been my proudest accomplishment to date. My expertise, across the manufacturing, diagnostics and safety disciplines, is outstanding. As an advocate of team work, innovation and continuous improvement, I’m proud to support the operators by sharing this experience with them. My skills have been sharpened through my propensity to adapt and anticipate and my natural flair for innovation and ingenuity. Pandrol’s ability to innovate with the highest quality technical interventions, means realising improvement for customers and staff. Working in the cutting edge of the market has provided me with unrivalled technical expertise that has enabled me to express acquired competences, in and out of the company, in different fields of activity. Outside work I enjoy spending time with my family. You will also find me immersed in do-it-yourself projects and photography, where I love to capture sporting events. I take also part to shooting sportive meetings in France at the occasion of tournaments, championships and friendly games with Belgian partners.